More on Orramel Gulick, 1874. Parents will be voyaging—We hear that Rev. Orramel H. Gulick came to get his weak parents [Peter Johnson Gulick and Fanny Hinckley Thomas Gulick] living here in a feeble state to take them to the young Gulick’s [Luther Halsey Gulick] new missionary parish in Japan.It is on the coming 2nd of April that they will all board the steamship to make their journey to Japan by way of San Francisco. To his parents who are leaving this land which they grew accustomed, we hope for blessings from above, to help them on their journey, and to give them safe landing at this foreign land, where their child works for righteousness. So too is our hopes for the endeavors of their child. 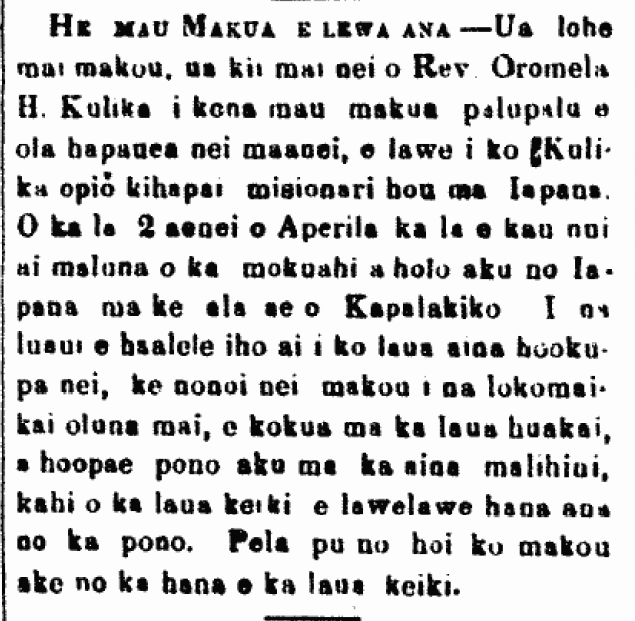 Ka Nupepa Kuokoa, Buke XIII, Helu 11, Aoao 2. 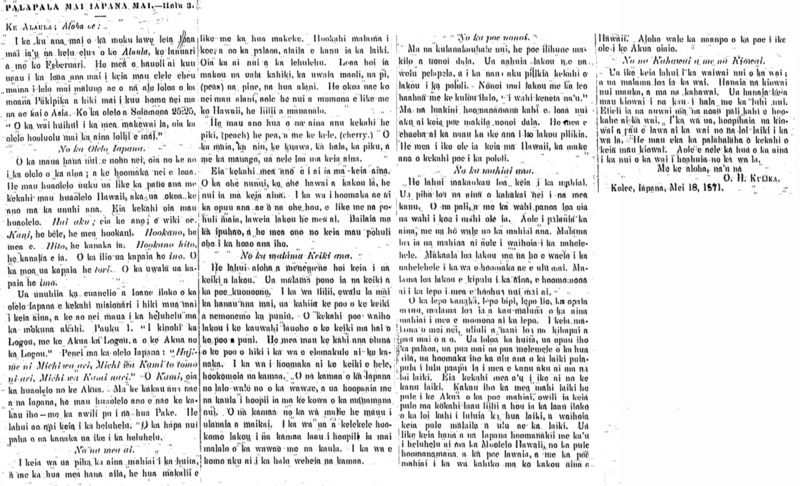 Maraki 14, 1874. More from Orramel Gulick, 1871. Our great task at hand is learning the language of this land; and we have begun. Some of the short words, the pronunciation is the same as in Hawaiian, but the translation is different. Here are some of those words. Hai aku [Hayaku]; this is the meaning; hurry up. Kani [Kane], a bell, something that sounds. Hookano [Hoka no], a different thing. Hito, a person. Hookano hito, a different person. Dogs are called ino [inu]. Chickens are called tori. Sweet potato is called imo. The Gospel of John was translated into Japanese by a missionary who came to this land before, and we are learning to read from the first chapter. Chapter 1. “In the beginning was the Word, and the Word was with God, and the Word was God.” Here it is in Japanese: “Hajime ni Michi wa ari, Michi wa Kami to tomo ni ari, Michi wa Kami nari.” When they write it however, they write in strange letters mixed with Chinese characters. The people study reading intensely. Perhaps more than half of the people can read. At this time, the fields are filled with wheat and oil producing fruit, which is a tiny fruit like that of the black mustard. In a month, the wheat will be mature, then rice will be planted. That is the main staple of the people. We have potatoes, sweet potatoes, peas, beans [pine? ], and oranges. Their oranges are different, they are not large and sweet like those of Hawaii, they are small and bland. They also have fruit of cold lands: peaches, pears, and cherries. Bananas, coconuts, guavas, pandanus, figs, and mangoes are not to be found here. Here is something strange eaten here. Large bamboo, what we call ohe hawai, is found in abundance here. When the new shoots begin to sprout, like a banana sprout, they harvest it to eat. It is boiled in a pot, and this bamboo shoot is good if it is tried. These are a people who love and are compassionate towards their children. The children of the wealthy are well taken care of. When they are little, eight days after birth, the head of the child is shaved smooth. Some leave some hair circling the edge of the child’s head. It is customary to shave the top of the head until they are elderly. When the child begins to walk, they are fitted with sandals. The sandals of the Japanese are just under the feet and are fastened with with straps going up from between the space between the big toes. The sandals used for nice days are made of finely-woven grass. On rainy and muddy days, they wear wooden sandals fastened below the feet with straps. When they enter the house, the sandals are removed. In large cities, there are poor who beg for money. They are clothed in rags, and when looking at them some of them seem to be suffering from starvation. They beg with soft voices and heads bowed down, “Please may I have a few cents.” These beggars are found in large numbers at places of worship. Seeing their suffering breaks one’s heart. This is something not seen in Hawaii, someone dying of starvation. This is a nation very skilled at farming. The lowlands are full of plants. The places left unfarmed are the cliffs and very dry areas. The land is not plowed, but is only worked with a hoe. Farms are well cared for, and are not left to go wild. They watch vigilantly and clear weeds with their hoe, when they begin to grow. They pay much attention to fertilizing the land to fortify the soil so that much fruit is produced. Night soil, cow feces, horse feces, and waste vegetation are kept and placed on the farmland to fertilize the soil. In this month of May, the farms as far as the eye can see are green and beautiful. The wheat is long, and the ears of wheat are forming, the yellow flowers are blossomed, the rice sprouts are beginning to be grown, sprinkled out all crowded, to be planted in the rice paddies. Here is something else I’ve seen of rice cultivation. The rice farmer writes a prayer to the God of farmers, this prayer is rolled about a small stick, and the stick is then stuck into the paddy where the rice seeds are spread, and this prayer is left there until the rice grows. This custom by the idol-worshiping Japanese is like what I read in Hawaiian History about the prayers of the fishermen and farmers of the ancient times in our land of Hawaii. How pitiful is the ignorance of those who don’t know of the true God. This nation knows the great value of water, and water is well cared for. Large reservoirs are made in the uplands, and by rivers. These reservoirs were made in times past with much labor. Canals are dug on sides of cliffs where water flows. In rainy periods, the reservoirs are filled to supply water to the rice paddies on dry periods. Some of these reservoirs are acres wide. The land will not lack fruit because of the great water reserved for dry periods. Kobe, Japan, May 18, 1871. 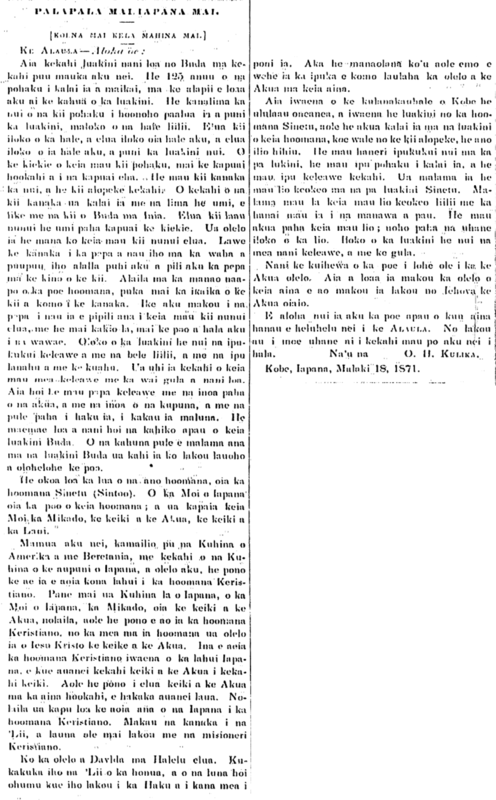 Ke Alaula, Buke VI, Helu 4, Aoao 16. 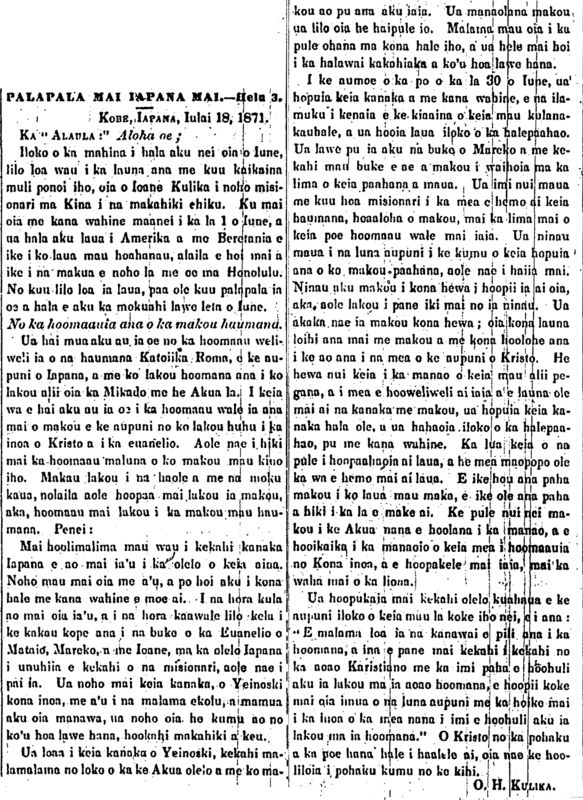 Iulai, 1871. Continuation of O. H. Gulicks letter from Japan, 1871. There is a beautiful temple to Buddha on a hill inland of here. There are 125 nicely hewn stone steps leading to the grounds of the temple. There are fifty stone statues placed in pairs all about the temple, in small buildings. There are two in one structure, and two in the next, and two in the next, all around the great temple. The height of these stone figures are from one to four feet tall. Most are human figures, but there also some of foxes. One of the human statues was carved with ten hands, like the Buddha statues of India. There are two huge wooden statues maybe ten feet tall. It is said that these two huge figures possess mana. A person a piece of paper and chews it in his mouth until it is wadded up; then he spits it out, sticking it on to the body of the statue. According to the ignorant beliefs of the worshipers, the power of the statue comes out and enters the person. We saw paper that was chewed up and stuck to these two great statues; it looked like a case of rash from head to foot. Within the temple there are numerous metal lanterns and tiny bells, and coal burners and altars. Some of the metal objects are beautifully decorated in gold. There are some metal plates with perhaps the names of the gods and names of ancestors and perhaps prayers that were composed written upon them. All of the decorations within this Buddhist temple are very fine and beautiful. As for the priests caring for the Buddhist temple, their heads are shaved bald. The second religion is totally different, that being Shinto. The Ruler of Japan is the head of this religion; he is called the Mikado, the child of God, the child of the Heavens. Earlier, American and British diplomats were talking to those from Japan, and said that the teaching to their people of Christianity should be allowed. The Japanese diplomats said that the Ruler of Japan, the Mikado, was the son of God, and therefore, it isn’t right to teach Christianity, for in that religion, it is said that Jesus Christ is the son of God. If Christianity is allowed amongst the Japanese people, then one son of God would end up opposing another. There should not be two sons of God in one nation, lest they fight each other. So the teaching of Christianity to the Japanese is strictly prohibited. The people fear the rulers, and do not associate with the Christian missionaries. According to the words of David in Psalms 2: The kings of the earth set themselves, and the rulers take counsel together, against the Lord, and against his anointed. However, I am hopeful that in no time, the doors will open and the words of God will enter far and wide in this land. In the city of Kobe, there is a deserted forest, and within it is a Shinto shrine; there is not carved god in the shrine of this religion, except a fox statue, a type of wild dog. There are hundreds of large lanterns on the grounds of this shrine, lanterns carved out of stone, and some metal ones as well. White horses are kept on the grounds of Shinto shrines. These small white horses are always kept, and they are fed all the time. Perhaps these horses are gods; spirits perhaps live within the horses. Within the shrine, there are numerous beautiful things made of brass and gold. How misguided are those who do not hear the word of God. When we learn the language of this land, we will teach them about Jehovah, the true God. Much aloha to all the people of my homeland who are reading the Alaula. It is of them who i dreamt of some nights ago. From me, O. H. Gulick. Kobe, Japan, March 18, 1871. 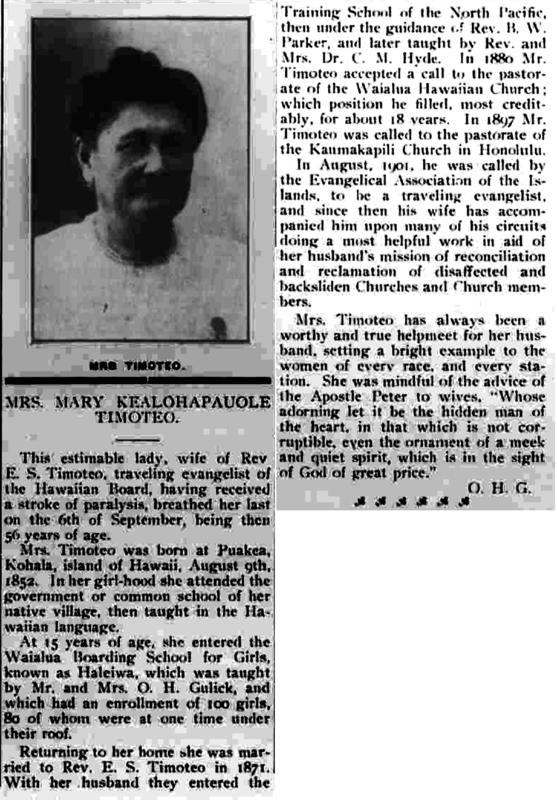 Ke Alaula, Buke VI, Helu 3, Aoao 10. Iune, 1871.